Almost every seat in UD’s Lerner College Trading Center was taken by 9 a.m. on the Friday before the start of fall semester, but the students were a bit more mature than the ones who would fill those seats once classes began. The students that day were some 40 business faculty members from schools across the country, and they were on campus to attend a one-day conference, “Integrating Financial Software Into Your Curriculum,” hosted by the Alfred Lerner College of Business and Economics. “It’s a dean’s dream to have a first-class room like this, and attracting people here from other universities to share knowledge extends that dream,” Bruce Weber told the group. 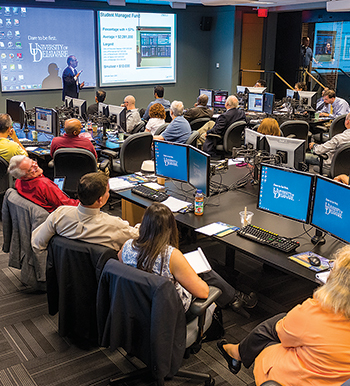 Weber, dean of the Lerner College and an expert on information technology, added that events like the conference are critical to making academic trading centers successful. UD’s trading center, which opened in 2008, is designed to replicate the trading floors in investment banks, brokerage houses and hedge funds on Wall Street.